What would a Jewish Museum be like? Would it be a museum of one of the three great monotheisms? Or of a race (defined as such by itself, by others or by history ) and was there a difference in this case anyway? Was it an examination of history or of the Jewish experience and how would it treat Israel? 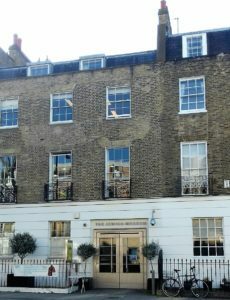 This 21st century, educated and atheist woman, went with an open mind to Albert Road, near Camden Town tube, This is the location, in a five storey town house, of the Jewish Museum. I was a little surprised by the security, two guards who politely asked to check our handbags before we entered. No different to the British Museum of course, but somehow more unexpected in this out-of-the-way institution. I guess that, unfortunately, the Museum has reason to ensure its safety. 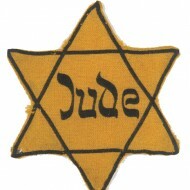 Anti-Semitism has never gone away and these days we are seeing again the attacks upon the ‘other’ in order to further a non-democratic agenda. Since I drafted this post the Telegraph has published a front page very reminiscent of right-wing anti-Semitic propaganda about ‘secret plots’ by Jews. Once within the building, the volunteers who operate it are friendly and welcoming. The Museum is something of a mixture, though an interesting one. 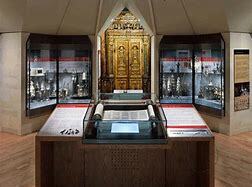 On the ground floor are rooms explaining the faith and tenets of the religion, through its customs, rituals and practices as represented by the, sometimes very beautiful, religious artefacts. So we see the cycle of a year, including Rosh Hashana, Hannukah, Purim, Passover and others, each explained alongside items used in celebration of those days. There are videos of family gatherings, individuals talking to camera explore the meaning of the ceremonies, in general and to them as individuals. As a matter of course this takes in a lot of biblical history too, told from the perspective of Jewish belief. The first floor examines the Jewish experience in Britain and in wider Europe, with a nod to Jews elsewhere in the world. The first Jewish settlers in any numbers came to these shores following the Norman Conquest and, expulsions aside, have been here ever since, gaining acceptance all the time. How successive monarchs treated British Jewry – usually badly, with massacres and murders – is captured. What their lives were like is touched upon, though there is more evidence the closer we come to the present day, with a lot of interesting social history about the East End of London, especially during the mass migration of refugees during the 19th century, from Russia and eastern Europe, then those fleeing fascism and Nazism. A telling exhibit for me was the board of newspaper stories, mainly from the early 20th century, which depicted the ‘swamping’ of these islands by criminal types, the depraved and lazy, taking housing and food from the mouths of hard-working indigenous folk. Each ‘story’ was on a board which one could lift, only to find a more modern piece beneath it, from the likes of the Daily Mail, saying very similar things now, though not necessarily about Jews. How far we like to think we have come, yet how we still repeat the injustices and cruelties of the past. Britain took some 70,000 refugees, many of them children, immediately before WWII, something which the Museum acknowledges. Today we take a miniscule number in comparison. Sections on WWII taught me about the 38th – 42nd Battalions of the Royal Fusiliers, commonly called The Judeans, describing the lot of the Jewish Tommy. I learned too about the English Jews who, upon the liberation of Germany, went into the death camps to take survivors to safety – some of these were women. One of them was the former Hackney neighbour of the friend with whom I visited the Museum. My friend had not known about her neighbour’s heroic past until after the woman died. The Holocaust has a room to itself and is presented mainly through one man’s experience, Leon Greenman OBE, an Eastender who survived Auschwitz and went on to devote his life to campaigning against racism until his death in 2008. It is all the more powerful for it. There is art, from 15th to the 21st centuries and just some examples from a wide-ranging photographic archive. The top floor is for temporary exhibitions, the current one being Designs On Britain, which shows just how much iconic British design was produced by Jewish emigré artists and designers. The Raleigh Chopper, that typical early 1970s children’s bike! I had one. The London Transport Bus Stop sign. This exhibition runs until 15th April and is free to enter with the standard entrance ticket for the Museum, which costs £8.50 (£7.50 concessions). It’s thought provoking and interesting, well worth a visit. This entry was posted in History, London and tagged History, London, Worth a visit by juliej. Bookmark the permalink.